We all love a good tropical vacation, don't we? Swim-up bars, palm tree-lined beaches, fruity rum drinks served in coconuts and pineapples, white sandy beaches... need I say more? But chances are, something holds most of us back from planning the trips we so longingly watch on other people's Instagram feeds. Maybe you don't have a passport, or the idea of not knowing the language scares you. 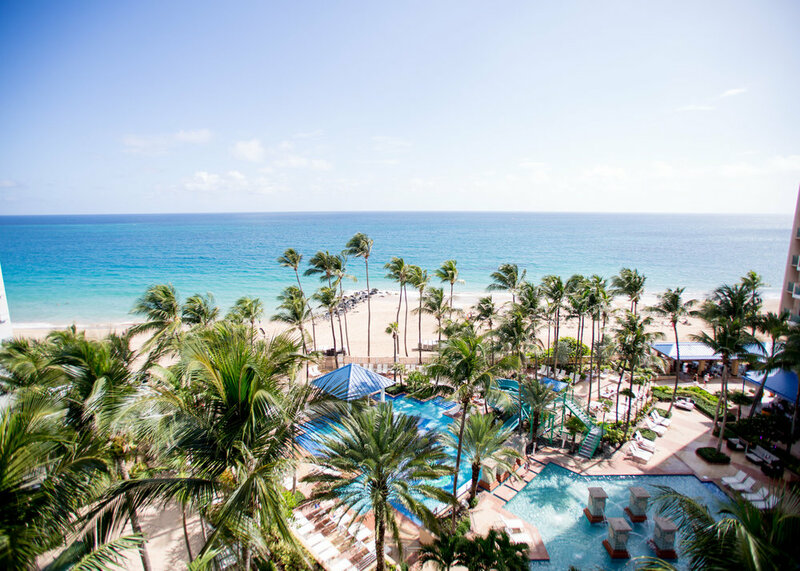 Maybe the flights are too pricey or you don't have the vacation days or the currency exchange is too confusing- whatever your excuse may be, we have you answer- it's time for a trip to Puerto Rico!! I know, I know... easier said than done, right? Well our goal is to convince you of just how easy- and exotic- Puerto Rico really is. 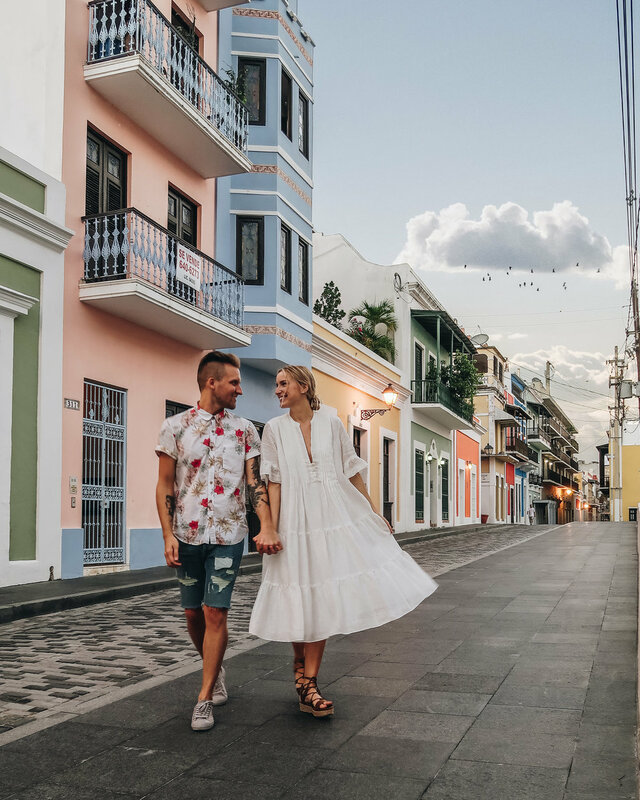 First of all, to give you a little taste of San Juan, check out our latest video recapping our adventures in Puerto Rico! One of our favorite things about Puerto Rico is the incredible ease of travel for Americans. Being a US territory, this tropical island doesn't require you to have a passport if you're a US citizen. That means no customs lines either! it's a quick 4 hour direct flight from NYC, and all the major US carriers fly into San Juan. That means that you most likely won't have tons of long layovers and your flight time will be so much less than flying somewhere exotic across the world. It's in our backyard! And also, while Spanish is spoken predominantly, you'd be hard-pressed to find somewhere that nobody speaks english! Ok- so you're ready to book your trip to Puerto Rico! Here's our list of 10 things you absolutely have to do while you're on the Island. Most people know about Puerto Rico, but not everyone knows that it is composed of several islands. Just off the east coast of the mainland are 2 small islands, Vieques and Culebra. They are virtually untouched and some of the most gorgeous places we've ever seen. 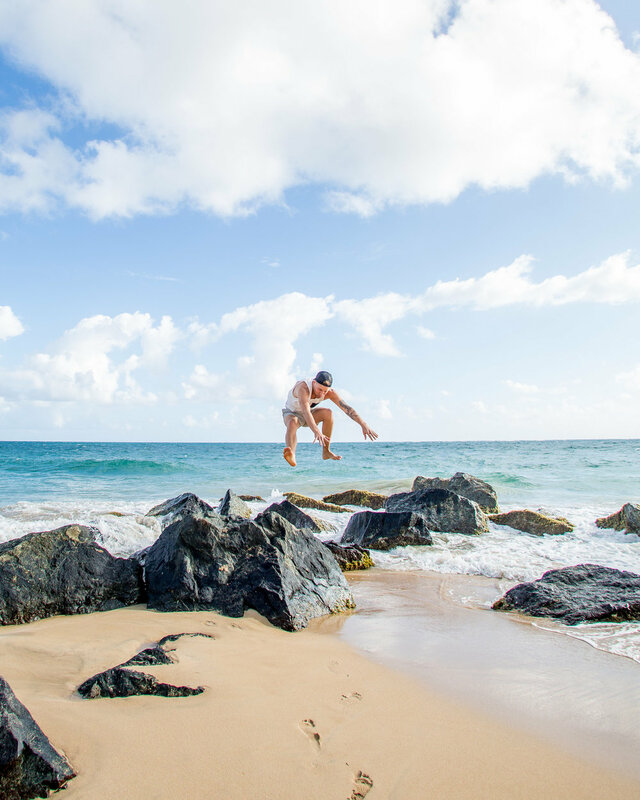 If you need a break from the party that is Puerto Rico, head over to either of San Juan's airports and catch a 25 minute flight on Vieques Air link to explore these exotic tropical islands. Everything from wild horses to black, white and pink sand beaches with perfectly turquoise water- all without the tourist scene. The small airline is inexpensive and so much fun- tiny 8-seater prop planes that make you feel like you're seeing the islands from a bird's-eye-view.. and so much more adventurous than a normal commercial jet! We'll post more about Vieques in our next post, but take our word for it- you'll feel like you stepped into southeast asia without the 20-something hours of travel (or the hefty price tag!). Okay, real talk: We quickly realized the first time we went to PR that there is an argument about who invented the Piña Colada. Apparently there was a drink making contest held at the Caribe Hilton, and the bartender who won was the bartender for a place called Barrachina. So the Hilton claims they invented it, but so does Barrachina. Whichever side you agree with, I think we can all agree that Barrachina is totally worth a trip to PR. Every time we're on the island we visit this spot (that we literally stumbled upon a couple years ago!). It's the most amazing Pina Colada we've ever had in the dreamiest setting. Not to mention there are parrots right beside the bar?! It's definitely a must-see. We went for the first time for dinner this past trip and got to witness a Flamenco show for free while we ate! It was such an authentic and cool experience that we will never forget, and it's a League Travels non-negotiable when you're in PR. El Yunque is the only tropical rainforest in the US national park system, but this dense jungle can hold it's own among the greatest rainforests in the world. Spend a day hiking and exploring, watching incredible wildlife and breathtaking scenery, and swim in waterfalls- El Yunque is nothing short of magical! This classic Puerto Rican dish is made from fried green plantains and topped with deliciously flavorful meat or vegetables. You can get it anywhere that serves local fare, and it's a non-negotiable for any visit to PR! 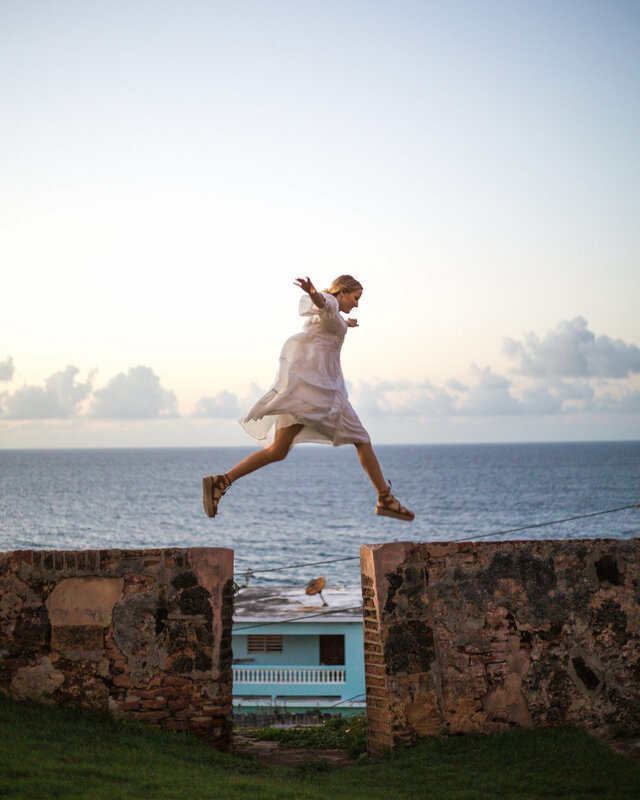 There are 2 forts that make up Old San Juan that are both pretty epic + historic. One in particular, Castillo San Felipe del Morro, has a huge lawn that people use to fly kites! It's such a cute tradition and an iconic thing to do when visiting Puerto Rico. Even though the majority of people flying kites are kids with their parents, we most certainly took part in the adventure ourselves! 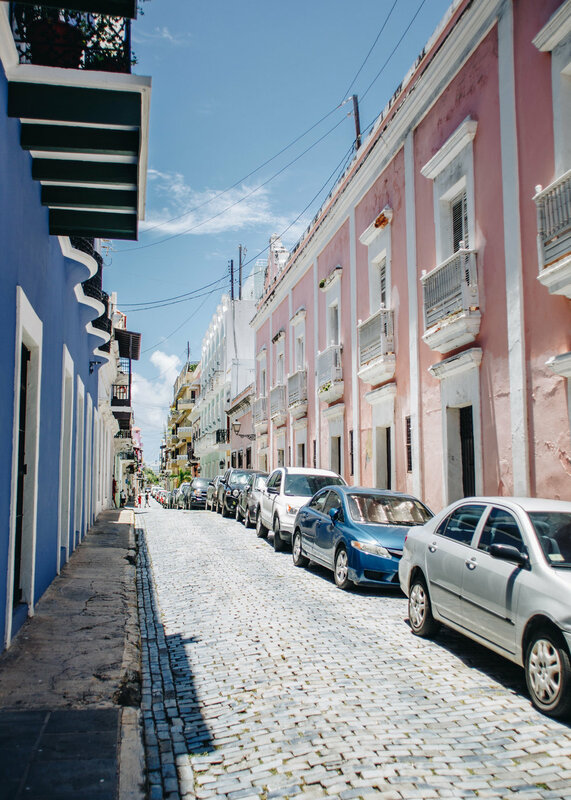 San Juan's historic center, known as Old San Juan, is a beautiful glimpse into Caribbean history. Old, winding streets and colorful buildings make up this neighborhood filled with cafes, restaurants, bars and shops. It's a sight to see during the day, but even more romantic at night when the nightlife starts up. Beautiful preservation and a vibrant food scene truly make this a remarkably exotic place to wander around for a few hours or a few days. Hit La Factoria's late-night secret speakeasy through the back, watch Flamenco dancing at Barrachina on a weekend evening, or wander into any of the seemingly endless open-air bars for a cocktail and dancing. 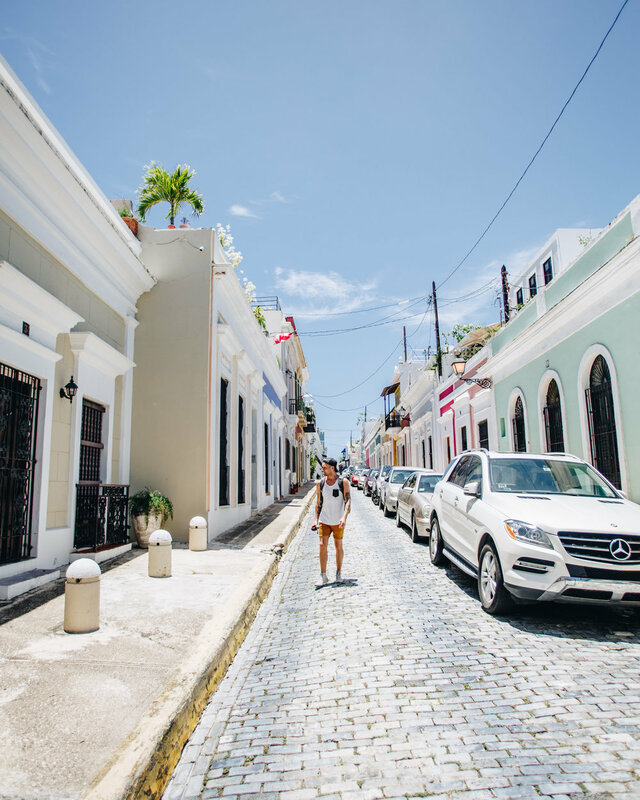 No trip to Puerto Rico is complete without an adventure in Old San Juan! Hopefully between our video and our recommendations, you're feeling pretty convinced about taking a trip to Puerto Rico soon! We know you won't regret it- and there is so much to see and do that we haven't even gotten to experience yet! Feel free to share some of your favorite PR experiences if you've been so we can make sure to put it on our list for next time!